UEFA’s punishment of Russia for disturbances at Euro 2012 that included fans assaulting Polish stewards and throwing flares on the pitch was too harsh, says President of the Russian Football Union Sergey Fursenko. Russia received a suspended six-point deduction for Euro 2016 qualification while the country’s FA was fined €120,000 for crowd disturbances and the use of pyrotechnics during Russia's Euro 2012 opener with the Czech Republic. There is a video showing Russian fan attacking Polish stewards after the game with four of them having to be taken to hospital. 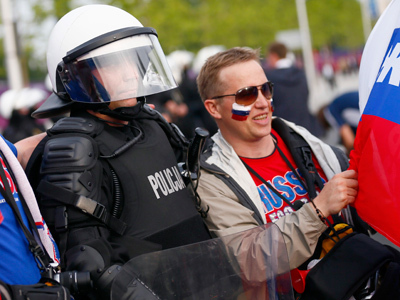 Speaking with the R-Sport agency, head of the All-Russian Fans’ Union Aleksandr Shprygin, stressed that Russian supporters had given one steward “a kicking” after he had tried to detain a Russia fan in a “heavy-handed” manner. According to Shprygin, the steward had tried to detain a nearby fan rather than looking for one who had earlier thrown a flare. “A very harsh decision came about after the disciplinary committee watched a recording of a steward being beaten,” Fursenko said, adding that his organization plans to make an appeal. Russian fans were not alone on the tournament’s black list. Germans and Croats were also involved in improper behavior during their teams first games, however, only the Russian side was handed apoints deduction. More sanctions could follow as UEFA was alerted about a number of allegedly “extremist” banners during Russia’s second game against Poland. 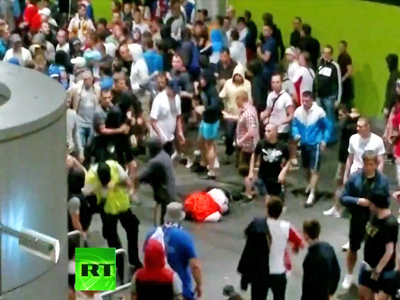 Russia's football chiefs have called on the Polish authorities to help protect peaceful fans from hooligans at the tournament. 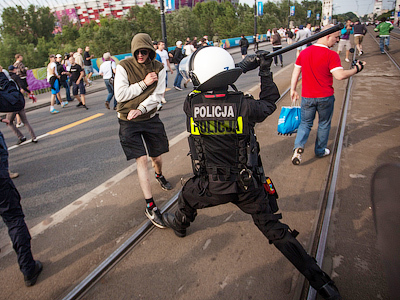 Earlier this week some Russians were attacked during an organized march to the national stadium in Warsaw ahead of Russia's game with Poland. Since then almost 200 Poles have been arrested along with 24 Russians. 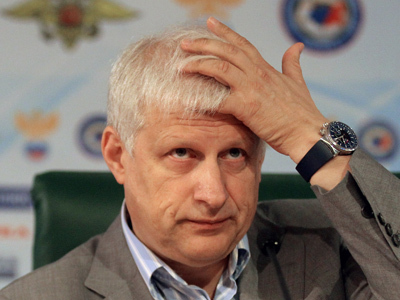 Sixteen people, including five Russians were either fined or sentenced to jail. Fursenko says many innocent people, including women and children, were victims and now feel afraid at the championships. He has urged the Polish authorities to do more to protect them.